If you own a TENS machine, it’s important to know that all TENS pads (electrodes) have a finite lifespan and you will need to purchase replacements at some point. 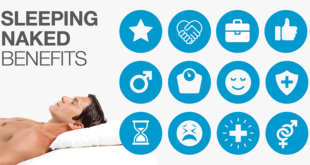 There is a range of pads available so to help you find the information you’re looking for, we’ve compiled a list of the most popular brands on the market and information about each, including important considerations, such as allergies, connection type and pack size. Read through our buying checklist to assist you along the way and maintenance guidelines to keep your pads in great condition. When shopping around, remember that the best TENS pads are ones that are compatible with your machine and fulfill your needs and requirements. There is a wide range of replacement TENS unit pads available, but due to the number of manufacturers, types of pads and price variance it can be hard to know what to buy. One of the most important factors is to know the type of connection between the machine and pads. If you’re wondering are TENS machine pads universal, the answer is both yes and no. Many machines come with a universal fitting, but not all machines do. To help you find the best TENS electrodes, have a look at the chart below, which contains some of the most popular replacement pads, and details on connection type, shapes and sizes, as well as other important considerations to assist with your search. 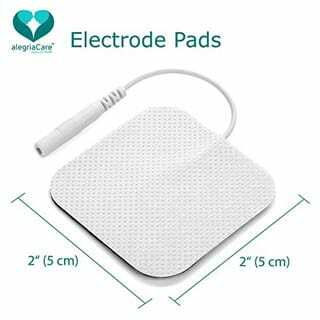 alegriaCare Electrode Pads Square 2" x 2"
HealthmateForever Assorted White Snap-on Replacement Electrode Pads Combo Small oval 1.75" x 1"
Large oval 2.5" x 1.75"
Discount TENS Omron Replacement Electrode Pads 3.23" x 1.89"
Syrtenty electrodes are an easy choice because they are suitable for most TENS units, come in a range of shapes and sizes and you can choose either pigtail or snap connections. 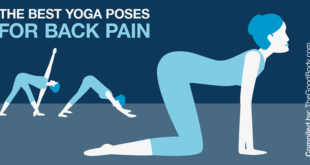 The smaller sizes are recommended for compact pain areas, such as knees or elbows, while the larger sizes or butterfly-shape pads are better for use on the back. These pads become even better value for money when you buy in bulk, which is especially useful if you use TENS frequently. The double sealed packaging (in individual groups of four) means you can keep your pads fresh and extend their lifespan. As medical-grade TENS electrodes, we’ve found these pads to be very good quality for the price. Additionally, Syrtenty electrodes are latex-free. These electrodes contain a patented MultiStick® hydrogel that is manufactured in the USA. Designed to be user-friendly, the pads are easy to apply and remove, don’t leave a sticky residue and can be used for multiple applications. What we love about alegriaCare is that they cater for nearly all TENS machines because their pads are available with either pigtail or snap connectors. Another added benefit of these high quality pads from alegriaCare is the one-year guarantee they ship with. 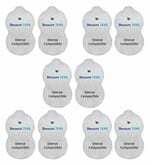 Like Syrtenty’s pads you can purchase these TENS unit pads in bulk, and they come packaged in sets of four to keep unused electrodes from drying out. They have a high conductivity and are made with a premium cloth, compared to other options available. 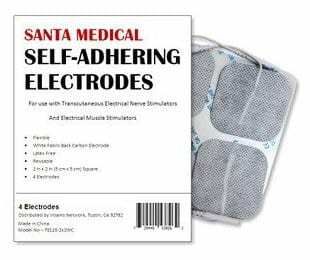 Made of solid carbon, the Santamedical Self-Adhering Electrodes contain a re-useable gel and a cloth backing for comfort. The 2″ x 2″ square pads are available in 10 packs of four and come with a standard pigtail connection. Consumer feedback suggests that these pads can last anywhere from 10 to 20 uses. Their lifespan can be prolonged and improved with appropriate care and storage (see maintenance section for more details). Santamedical electrodes specify they are latex-free and are an appropriate choice if your skin is prone to irritation. As we see it, these pads are a more affordable option, without compromising on performance. Suitable for any TENS unit with industry standard 3.5mm snap connector, these hand-shaped pads are a more cost-effective option. 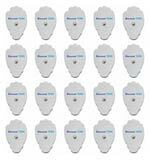 Measuring 3″ x 1.77″, the Discount TENS Large Electrode pads are available for purchase as ten pairs (a total of 20 pads). We were able to find them online at the time of writing for under $20 and they come well reviewed. These pads evenly distribute the current without any hot spots often associated with cheaper pads or replacements. The strong adhesion means the pads stick well, but don’t leave any residue. We found these pads to be very durable and flexible. Overall, the Discount TENS pads hit the sweet spot between price, quality and performance. 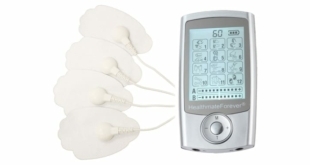 The HealthmateForever electrodes are similar in offering to the Discount TENS Large Electrode pads, but are only sold as a set of five pairs. 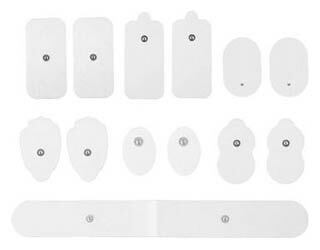 Compatible with snap fitting TENS machines, these hand-shaped pads are made of a medical non-woven material. Based on our experience, the pads are very flexible and breathable, thus are perfect for use around joints, such as the knee, ankle or elbow. The self-adhesion on these pads has mixed reviews and may not be as strong as some of the other options on the market, but some customer feedback suggests that they can last for 10-15 uses. 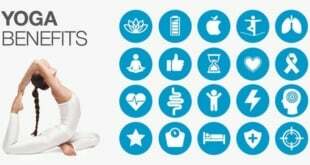 HealthmateForever pads are interchangeable for most makes and models of snap connection TENS. 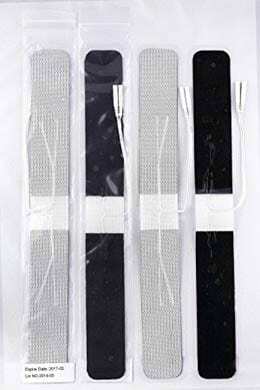 Eco-Patch’s white foam backed electrodes contain a black carbon conductor and Covidien gel adhesive. The square pads are suitable for most TENS machines with a pigtail connection, but have very mixed reviews. Although Eco-Patch offers some of the cheapest TENS replacement pads, some users found they did not deliver as expected, or work as well as the original pads that shipped with their machine. A few consumer criticisms of these pads include: they are not as flexible as alternatives; adhesion wears off faster than it should and the electrical current is not evenly distributed. Due to the foam backing, these pads may not be the best choice for curved areas, such as joints. For the low price, these pads could be worth trying but may not offer the same performance or longevity as some of the higher quality alternatives. 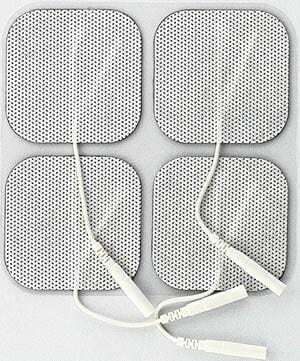 If you have a TENS unit that requires electrodes with snaps and you’re unsure about which pads to buy you should certainly consider this selection from HealthmateForever. The set includes seven different shapes, including small and large ovals, rectangle, and hand and gourd-shaped pads, ranging in sizes from 1.75″ x 1″ to 12″. A combination pack is a great way to experiment and test different shapes and sizes without having to buy them separately or in bulk. Although this set is one of the pricier options, the pads are versatile; and, we think, the best if you utilize your TENS device to target pain in different areas. The high quality of the adhesion on these pads means they withstand multiple uses if stored properly. Made by Discount TENS, these replacement pads are compatible with Omron machines only. The small gourd-shaped pads are flexible, yet sturdy, meaning they are easy to handle and position. Sold in pairs of five, the pads are competitively priced and, according to a large number of users, are as good – if not better – quality to the Omron pads. A thick, reusable hydrogel layer means the pads are easy to secure and distribute the current well. Many people find the pad’s backing (made of medical grade non-woven material) to be sturdier than Omron’s own pads. Because these pads come at a more affordable cost, we think they’re a viable option for Omron machines. Like the Srytenty square pads, the Long Strip TENS Unit Electrodes are another premium quality product. At the upper range price, Srytenty electrodes may come with a higher price tag than some of their competitors, but we think they have a noticeable quality difference. With excellent adhesive properties, many consumers find these electrodes retain their stickiness longer than other pads. Additionally, the cloth backing makes the strips more flexible and enables them to follow the natural contours of the body. The electrodes are suitable for units with pigtail connections, have a shelf life of three years from the manufacture date and are latex-free. Like the alegriaCare Electrodes also included in our selection, the round shaped electrodes, contain the patented MultiStick® hydrogel that is manufactured in the USA. Not only are these pads are easy to apply and remove, but also don’t leave a sticky residue. alegriaCare pads are compatible with a range of TENS machines because they are available as pads with pigtail connectors or pads with snaps. We like alegriaCare because their pads are high quality and come with a one-year manufacturer guarantee. You can purchase these in bulk, and they come packaged in sets of four to keep unused electrodes from drying out. They have a high conductivity and are made with a premium cloth, compared to other available options. Measuring 2″ square, the most common size of electrodes on the market, the Doneco electrodes are like a number of other electrodes we’ve featured. Sold in a pack of 48, this is the largest set available for purchase that we’ve been able to find. For this reason they are very competitively priced, especially when you calculate the cost per pad. The electrodes are well reviewed and noted for their quality. We’ve found them to have a long lifespan, both in terms of durability and adhesion. With latex-free and non-irritating properties, Doneco electrodes are safe for use with different skin types. The pads are universal for any machine with pigtail connections. Reusable packaging ensures the pads stay fresh for as long as possible. These pads are high quality, but if you aren’t satisfied they come with a three-month warranty. When buying TENS unit replacement pads, you need to know what type of fitting is compatible with your machine. The two most common types are pigtail (or pin type) and snap. In addition to the two main connection types, there are a handful of machines that have special proprietary fittings and don’t accept universal fit electrodes. A pigtail connection is the most widely used fitting for TENS devices. These electrodes have a short wire extending from the pad that is used as the connection point to the electrical leads from the TENS, making it easier to attach. Pins are usually specified at 2mm, but generally accept a variance from 1.8mm to 2.2mm pins. Snap connectors have a standard 3.5mm diameter snap. Lead wires from the TENS unit will easily snap to electrodes through the fitting. The snap connection offers a strong attachment point to ensure the electrodes stay in place and remain connected to the machine while in use. Omron machines have the smallest snap connector (2.2mm), but have a unique fitting therefore they don’t accept standard snap electrodes. Most electrodes that are 2.2mm specify that they are suitable for Omron machines only, but take precautions and double check the diameter before purchasing. If you have an Omron machine, you can buy their own pads, or Omron compatible pads produced by other manufacturers. Although the Compex EMS fitting has a 3.5mm snap connection, their connectors have a special fit, which makes them incompatible for universal 3.5mm snap electrodes. Be aware of this and ensure any replacement pads, whether Compex own brand or third party brand, specify that they are a Compex EMS fitting. TENS pads come in a range of shapes and sizes. Below we list out the most common pad sizes and how they can be used most effectively. The most common and popular pad on the market is the square 2″ x 2″. Usually used as a set of four, square pads are perfect for distributing the current at multiple points, but small enough to target more specific pain areas. Owing to the shape, the pads cover a uniform surface area and thus address the pain in a uniform manner. Coming in a variety of dimensions in circular or oval shapes, round pads are good for small joints or flat areas, such as the elbows, knees and abdominals. These are some of the smallest pads on the market and are great for localizing the current when you need to target a specific area, or have hard to reach pain. Butterfly shaped electrodes are often used on the lower back area, which is a common source of pain for many people. Their large size makes them easier to place, helps distribute the current across a wide surface and follows the contours of the back. Strips, or long rectangular pads, are perfect for big joints and flat areas. 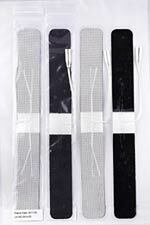 The strips are particularly useful for targeting back or spinal pain. Due to their length, these pads can also be used to wrap around areas like calves, thighs, abdominals, or biceps and triceps to promote better circulation or to tone muscles, particularly the abdominals. Buying replacement pads for a TENS device can be a daunting task, but if you know where your target pain areas are and do your research you can find quality electrodes that suit your needs. To make the process easier, review our buying checklist to help you make the most appropriate purchase. Before beginning your search for pads, you need to know what connection type is used for your TENS, as this will help narrow down your search and ensure you are buying a product that is suitable for the machine. Review our shape guide to get an idea of which type of pad will best address your needs, or if you utilize your TENS for multiple areas consider buying a combination package. As with many things, you get a better price on electrodes if you buy in bulk. However, if you use your TENS infrequently, you may not want to purchase and store more pads than you’ll use. By knowing how much you use TENS, this will help inform how quickly you get through your pads and therefore how many you should purchase. Make sure you do adequate research on the different options available and read feedback and reviews from customers. It’s also worthwhile to read up on the manufacturer details and specifications to ensure you are as informed as possible about what you are buying. 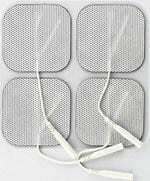 Once you’ve found the perfect electrodes for your TENS machine and suitable for your needs, purchase your replacement pads. Make sure to follow maintenance guidelines in order to maximize the pads’ applications and use. We’ve compiled a list of the most useful tips and recommendations for prolonging the lifespan of electrodes. However, always check the manufacturer’s guidelines before taking any actions, as you could damage your pads if you don’t look after them appropriately. Here are a few quick tips recommended by manufacturers as to how to best care for your electrodes pre and post-application to ensure you can get the maximum number of uses from them. Clean and dry the application area. Remember you should only apply electrodes to unbroken skin. Open and remove electrodes from packaging. Remember to keep the original packaging. Peel electrodes away from release sheet by lifting the edge of the electrode. Do not pull electrodes up by the wires. If electrodes seem dry, or the pads don’t stick, add a few drops water to moisten gel and wait a few minutes to allow water to re-hydrate the adhesive gel. Place electrodes on treatment area. Apply finger pressure to the edges and press down on entire electrode to assure adequate contact with skin. Gently peel off the electrodes. Wipe off electrodes with a non-alcohol wipe or rinse with cold water and wait for it to dry. Sticky side should remain up so it does not adhere to anything. Place the sticky side of the electrode on the clear sheet it arrived in and put back in the packaging. Store electrodes in a cool, dry place not exposed to bright light or any extreme temperature as it may have a permanent adverse effect on the gel. Electrodes can also be kept in the fridge to maximize their lifespan. Based on our research we’ve found some useful hints and tips from users. Please be aware that these are not suggestions from us, and may not be recommended by manufacturers, so should only be followed at your own discretion. Many people have different ways in which to prolong the adhesive gels and how to clean TENS unit electrodes. Some people think the key is to wash them after use with water, and a few people also recommend using a hypoallergenic soap, such as Dial. Other users have found that spraying the pads with water and applying them (while still damp) to the plastic will keep them stickier between uses. Certain suggestions include putting a drop of rubbing alcohol on the pads and rubbing two together in order to reignite the adhesion. Please be aware that some manufacturers state that alcohol should not be used on electrodes. Always check the manufacturers’ documentation or product details before doing this. To maximize the lifespan of pads, make sure you know how to store TENS electrodes properly. The best way to do this is to keep pads in original packaging and keep them as airtight as possible in order to maintain the quality of your pads. Although you want to make your pads for a long time, you do need to make sure they retain their effectiveness. It’s difficult to know exactly how long TENS electrodes last and when you should replace them, because this depends on several factors, such as the quality of the pads, frequency of use and how well you look after them. Many users of higher rated pads report getting between 10-15 uses out of a set before they need replacing. However, if you read reviews of some cheaper, or lesser quality, electrodes, you can find that consumers complain they only get a couple of uses from a set. Will my TENS machine work with pads by third parties? 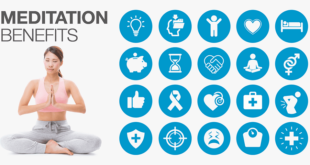 TENS unit manufacturers tend to encourage you to use their own brand pads with their machines; however most pads use a standard or universal connection, which allows you to use any brand pads with the same connection type. For best results, it is recommended that you use genuine, or brand name, electrodes. In some cases you will need to use the manufacturer’s brand pads. For example, although the electrodes for Compex electric muscle stimulators are a snap fit they have a unique connection that requires Compex brand pads. A few users have noted ways in which you can modify the connection wires so that they fit Compex devices, but we would not recommend doing so as it will more than likely invalidate the device’s warranty. Can TENS pads be used for EMS units? Most pads are sold and marketed by manufacturers for TENS and EMS units. Some pad manufacturers market their products more generally so that they can be used with different electrotherapy devices. If your TENS or EMS unit has a standard pigtail or snap connection, any electrode therapy pad should work with the device. We’ve tried and tested a number of different pads with various TENS and EMS machines and have had no problems getting the same ones to work with both types of devices. Again, just remember that most manufacturers will state that for best results you should use their own brand pads. How many sessions should I get out of a set of pads? / How long do TENS electrodes last? The number of applications or sessions you will get out of a set of pads will vary depending on a number of factors. First, the quality of your pads is a strong indicator as to how long your pads will last. In theory, you pay for what you get so more expensive pads should have a longer lifespan, but this is not always the case. Additionally, the length of time you use your machine will impact how long your pads will last. If you use your machine multiple times during the day, several days a week, your pads will wear out much faster than if you only use your machine an hour or two a week. Remember, you should always take care not to overuse your machine and we would recommend seeking medical advice about how often you should be using it. One way to extend the lifespan of your electrodes is to rotate between two sets of pads, especially if you use your machine frequently. Naturally, if you take good care of your pads and follow maintenance instructions, this will preserve the quality of the pads and ensure they last longer. Do not underestimate the importance of prepping the skin before use. To prepare your skin, make sure it’s clean and free of oil or creams by washing the application area. If you do not, you may find the pads won’t stick. You should also wash your pads after use to rid them of any residue. Always let them dry and then store them in airtight packaging. 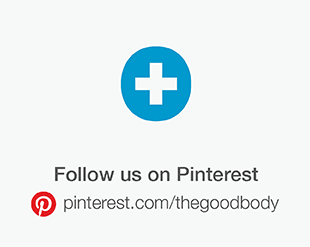 One user says that, with good care, their pads have been used 30 or more times. The majority of TENS units are dual channel with two outputs, meaning you can use two or four pads at a time. Most people use them with four pads at a time. The number of pads you will need depends very much on the size of the pads and where you will be applying them. How many pads should I buy? When deciding how many pads to buy, there are two important considerations to take into account: how often you use TENS and the cost per pad. 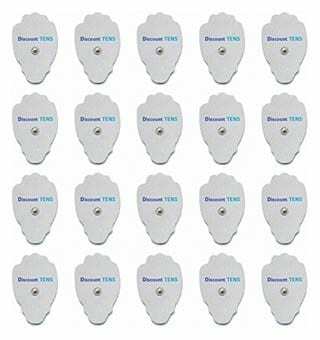 Many suppliers offer discounts when you buy in bulk, for example these DONECO Square TENS Unit Electrodes. But, if you do not use your machine regularly buying in bulk may mean the pads expire before you have a chance to use them. 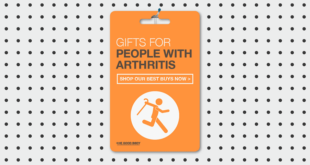 If you suffer from chronic pain and use your device regularly it will probably make sense to stock up on pads. Not only will your batch last longer, you’ll be able to pick them up for a much lower price per pad. For example, if you use your machine three times a day and are able to get 15 uses out of each pad that will mean you’ll need a new set of pads every five days. To avoid extra shipping charges and regularly risk running low on pads you may choose to purchase in bulk. Based on this usage and lifespan, if you bought a pack of 48 they would last you 60 days, or two months. On the other hand, if you only use your machine occasionally then it may not be as important to stock up on electrodes. Whereas, people who use TENS a couple of times a week, only when pain flares up, that set of four pads may last a few weeks. 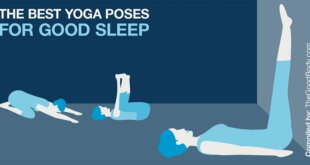 Do however consider with this approach that if you forget and run out you may be in a position where you can’t use your machine when you really need to. Also, consider that the price you’ll be paying per pad is usually higher if you buy in small quantities, and you are likely to incur extra shipping charges. Where can I buy TENS unit pads? You will find TENS unit pads for sale online, and are widely available on many websites, such as Amazon, Walmart, CVS, Target and Walgreens. If you want to buy pads locally, visit your nearest pharmacy. Several online retailers offer free shipping on orders as well. Can I share my pads with somebody else? Electrodes it clearly states: “Single Patient Use Only”. That’s not to say that you can’t share your TENS machine with somebody else though. Just ensure users have their own set of pads and you don’t mix them up! If my TENS machine has pigtail connectors can I use snap connection pads and vice versa? TENS machines only work with one type of electrode connector. In the event that you buy pads with the wrong connection for your machine, if you purchase an adapter you may still be able to use the pads. Adapters are available for universal pigtail and snap connection pads. Additionally, it’s important to note that machines have different size plugs on lead wires. The three most common are: 2.5mm jack, 3.5mm jack and 2.35mm shielded plug. When purchasing adapters make sure you buy the lead wire with the correct fitting for your machine, as these are not interchangeable. Are TENS unit pads interchangeable? Pads with universal fittings are interchangeable between machines with the same fitting. For instance, any pad with a pigtail connection can be used on any TENS machine that accepts a pigtail connection. You can also alternate pads between uses, or use pads of different shapes and sizes with your TENS. Should the pads be FDA cleared? Amazon does not allow products to be sold on their website that do not comply with FDA regulations; therefore this should be mentioned in the product description. The FDA clearance should also be stated on the product packaging. If you are unsure or want to confirm a product individually you may also go to the FDA website and confirm. Are these pads compatible with my TENS unit? If your TENS unit uses either of the two most common connectors for the pads: pigtail or snap, it’s likely you’ll be able to use any pads that are made as universal pigtail or snap on electrode pads. Be aware that most pigtail connectors have a tolerance of approximately 10%, meaning the standard 2mm fit should work with any pin ranging from 1.8mm to 2.2mm. If you’re unsure whether electrodes are suitable for your TENS machine, we’d recommend that contact the retailer or check the product listing, reviews, as well as any customer questions and answers. Do I need to use electrode gel with my pads? In a word, no! You don’t need electrode gel. 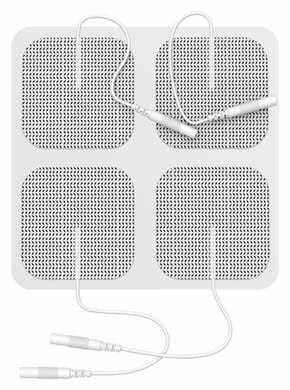 However, if you use it effectively it can make the electrodes conduct better and prolong the life of your pads. Users report that electrode gels extend the life of their pads by improving conductivity of the pulse to the skin. In addition, gels are great for reducing any stinging sensations that may be felt. 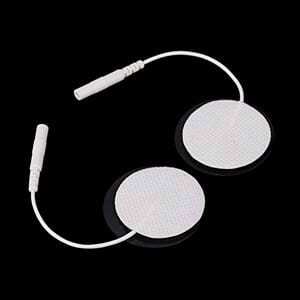 You can read more about electrode gel and other TENS unit accessories here. If you need to enhance the adhesive properties of your pads, we’d recommend taking a look at this one (Amazon link). When purchasing gels make sure you find ones that are specified for electrodes. Most electrode gels have salt-free and non-irritating properties to make them suitable for long-term applications. Due to the strong adhesive nature of electrode gels, only a tiny amount is needed on each pad and should be evenly spread across the surface. According to users, you should allow the gel to set on pads for several hours between application and use. With proper applications and care, using electrode gels can help prolong pads and eliminate the need to frequently replace them. 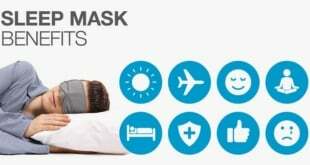 What pads are suitable if I have sensitive skin or latex allergies? The most common complaint for electrodes is allergic skin reactions, usually in the form of a rash, which is noted by approximately 2-3% of patients, according to electrotherapy.org. Causes for this are due to the material of the electrodes, the conductive gel or tape used to keep electrodes in place. If you have sensitive skin or latex allergies look for a manufacturer who specifies that their electrodes are latex-free or non-irritating. All the TENS electrodes we’ve included use self-adhesive or pre-gelled electrodes. These help reduce cross infection risk, are easy to use and have lower allergy incidence rates.